Many of the world's biggest food companies behave as though the water they rely on is both cheap and limitless. Yet, through their massive reach and supply chain influence, these companies have the power to build a water-smart future. Food companies are in the bull’s eye of climate change, and hotter temperatures are making water—the resource that drives the $5 trillion global food and agribusiness sector—one of the biggest risks to the industry’s bottom line. Many food companies are unprepared, however, for climate change’s profound impact on the water resources that sustain their operations and agricultural supply chains. What’s more, food companies are not only at risk for water scarcity, they are also responsible for it. Agricultural production uses more than 70 percent of the world’s freshwater resources and is the biggest polluter of waterways worldwide. Similarly, agriculture’s large carbon footprint contributes to the erratic weather that creates further financial risk for food companies. All of this makes robust water management a business imperative like never before. The financial fallout of growing water scarcity is evident. In news headlines and on earnings calls, major industry players like Nestlé, Coca-Cola and Diageo are disclosing financial impacts linked to water challenges, including scarcity-driven tariff hikes, agricultural supply chain disruptions, and lost growth opportunities in water-stressed markets. So far this year, more than 90 food sector companies have flagged water risks in their earnings calls with investors. Some 85 percent of the companies scored in this analysis reported water as a material risk in their financial filings. Financial risks associated with water withdrawals and wastewater are highly material to each of the four industries studied (meat, beverage, agricultural products and packaged food), according to an analysis by the Sustainability Accounting Standards Board. While climate change is one of the biggest drivers of water stress, other risk drivers from weak regulations to water pollution are also ratcheting up the pressure on the food sector’s precarious water security. 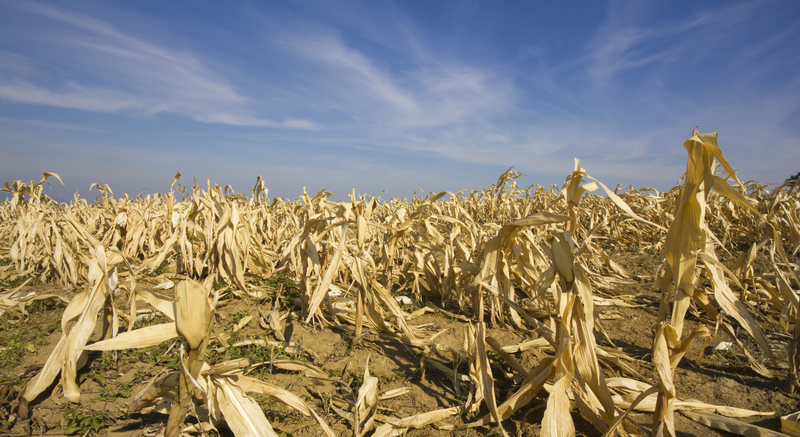 Climate change: Extreme weather, including droughts, hurricanes, floods and changing weather patterns will fundamentally alter what can be grown where and drive down global agricultural productivity. Click here to learn more. Growing competition: Urban migration, population growth and rising incomes are creating a perfect storm. Even as the food and agriculture sector’s water consumption will need to grow 20 percent to feed an additional three billion people by 2050, food producers will be competing with rising urban demands for water. Weak regulations: The U.S.’s decision to weaken water regulations contributes to an already anemic approach worldwide to water management. Many local and national governments don’t have the political will or ability to manage competing water demands, maintain acceptable water quality or enforce permits. Failing infrastructure: The story is the same in both developed and developing countries: water infrastructure systems are massively under-funded. The U.S. alone needs to invest $1 trillion during the next 25 years in its water infrastructure. Whether aging or inadequate, the world’s systems are spawning growing social inequity and business risks. Pollution: Water pollution from agriculture is rising. Agriculture, one of the world’s biggest water polluters through fertilizer and pesticide runoff, is triggering even more deterioration of water quality as farmers intensify production to keep pace with demand. Click here to learn more. As competition for water rises and higher global temperatures disrupt water supplies, the vulnerabilities of companies’ agricultural supply chains are particularly exposed. How those vulnerabilities play out at the farm level is greatly influenced by whether crops are rainfed or irrigated. Irrigated agriculture provides about 40 percent of the world’s food. But almost all of the world’s major breadbaskets, including the U.S., Mexico, the Middle East, North Africa, India, Pakistan and China, are in regions where irrigation for growing crops is severely depleting critical aquifers. While 80 percent of the world’s cropland and more than 60 percent of the world’s cereal grains rely on rainfed production, climate change modeling shows that precipitation variability and more extreme weather will increase, impacting the predictability of yields in some regions and the productivity of others. The implications for the businesses that rely on these crops is profound. A recent MSCI analysis of food sector companies in its All Country World Index found that $459.2 billion in revenue is at risk from lack of water availability for irrigation or animal consumption, and $198.2 billion is at risk from changing precipitation patterns affecting current crop production areas. The result? Wall Street is starting to put more pressure on the food sector to tackle the impacts of a warming planet. 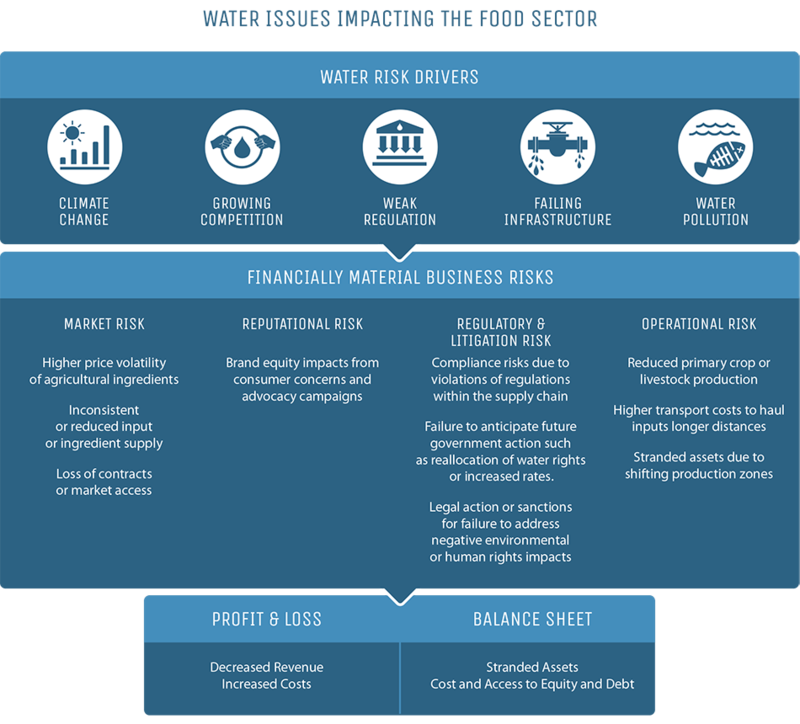 Investors expect food companies to not only cut their greenhouse gas emissions, but to improve their water risk management. The industry is behind. The impact companies are already seeing on their day-to-day business operations and the bottom line shows just how massively they need to overhaul their approach to water management. In 2015, Kellogg saw an increase in electricity costs of 32 percent at their manufacturing facility in Sao Paulo due to the drought in Brazil and dependence on hydropower. For more detailed definitions and examples of sustainability risk linked to the food sector explore Engage the Chain.